Kawasaki has just launched the Ninja H2 SX at the Auto Expo. The supercharged motorcycle based on Kawasaki’s hyperbike – the H2 – is the touring variant of the H2 line. In keeping with that image, the motorcycle gets a slightly revised engine that has been developed to enhance street usability. The 998cc, supercharged motor makes roughly 200bhp and generates 137Nm of torque. The motorcycle will be available in standard and SE trims. In SE trim, the motorcycle gets a whole bunch of accessories as standard. This includes the comfort seat, larger windscreen, centre stand, heated grips and a power socket. Both motorcycles have various touring accessories that include a set of panniers available as optional extras. The H2 SX gets the best of Kawasaki’s electronics a standard. That means there is traction control, cornering ABS, cornering lights, a six-axis IMU and everything else you would expect of a high end superbike. The suspension is fully-adjustable at both ends, and 320mm rotors supply braking power up front. 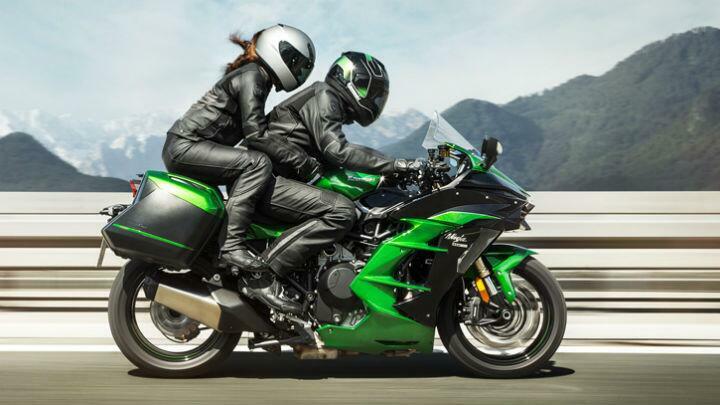 The Kawasaki Ninja H2 SX will be priced at ?21.80 lakh while the SX SE will cost you ?26.80 lakh. Also on display at the Kawasaki pavilion was a fully accessorised Vulcan S. The accessories make it more highway worthy with bits like a large windscreen and panniers on the side. The Vulcan S was launched earlier this year and is priced at ?5.44 lakh.